Opening Reception: Fri., August 27, 5:00 – 9:00 p.m. 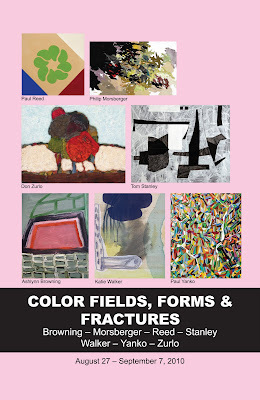 Opening on August 27, 2010, with a 5-9 pm reception, if ART Gallery presents at Gallery 80808/Vista Studios in Columbia, SC, a group exhibition of abstract paintings by seven gallery artists. 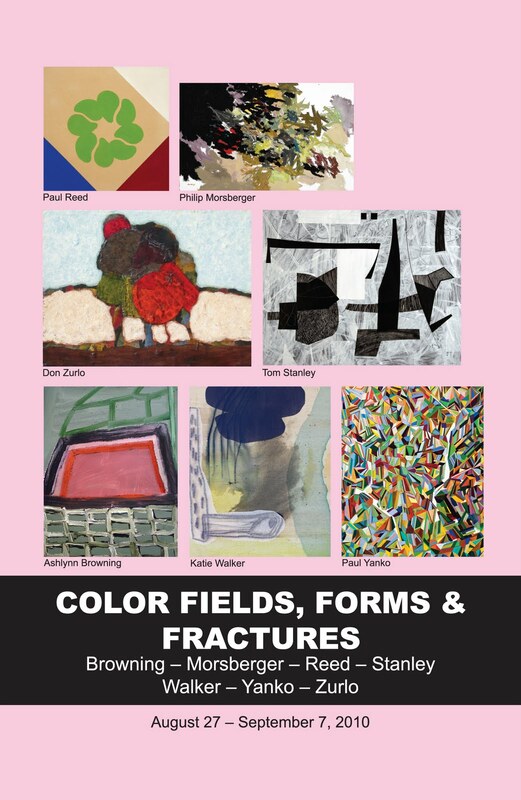 Included in the exhibition are Ashlynn Browning of Raleigh NC, Tom Stanley of Rock Hill, SC, Paul Yanko and Katie Walker of Greenville, SC, Philip Morsberger of Augusta, Ga., Don Zurlo of Lexington, SC, and Washington Color Field great Paul Reed of Arlington, VA. The exhibition will run through September 7. All the artists in the exhibition present non-objective paintings fitting within the traditions of Abstract Expressionism, Color Field and Hard Edge painting or Constructivism. Paul Reed (b. 1919) in a sense provides the common denominator within the exhibition with paintings that provide elements of all the genres mentioned here. An Abstract Expressionist in the 1950s, Reed became a pioneer of the prominent 1960s school of Washington Color Field painters, creating luminous paintings with daring color schemes and often hard-edged shapes. In his work of the past decade, he has combined more expressionist and hard-edged and Constructivist elements. Katie Walker (b. 1970) and Don Zurlo (b. 1934) throughout their careers have worked at the crossroads of Abstract Expressionism and Color Field. Philip Morsberger (b. 1933) is an essentially representational painter who through his vigorous brushwork creates Abstract Expressionist paintings the moment he opts to leave out the figure, as he frequently does. Ashlynn Browning (b. 1977) comes out of the Abstract Expressionist tradition but in the past year has added some Constructivist elements to her work. Tom Stanley (b. 1950) has developed his black-white-red representational paintings with strong mechanical and graphic elements into abstract paintings with similar qualities, where lines and shapes float against white-and-gray backgrounds. Paul Yanko (b. 1968) adds layer upon layer as he constructs from an array of small geometric shapes rather intricate paintings that relate to Color Field an Hard-Edge, with an element of Op Art.